Members of the House are on recess until September 4, while the Senate returned for business in Washington, D.C. this past week. A recess is not a vacation for lawmakers; they are district work days meant for you to engage with your elected officials locally. Connecting with your Members of Congress during this recess is a terrific way to show that you are interested in partnering for good policy. If your Senators or Representative voted in a way you agree with, taking the time to say thank you is a great way to build a long-term relationship. If they voted in a way you found challenging, connecting to follow up is the right way to build ties and share how you are willing to be a good resource about the issues that are important to you. Call your lawmakers' district offices and ask for appointments with your Senators and Representative while they are home. Connect with them at a public event (parade, festival, etc.). Submit an op-ed to your local paper. Use Facebook or Twitter to engage your Members of Congress. Senators plan this week to begin debate on a package consisting of funding bills for Defense (S. 3159) and Labor-HHS-Education (S. 3158) for the fiscal year that begins October 1. Together, the two bills make up about 63% of total discretionary spending subject to budget caps for the coming fiscal year. The legislative vehicle for the pair is the Defense bill (H.R. 6157), which has already been passed by the House. It's been 11 years since a Labor-HHS-Education bill reached the floor; Movement this year is facilitated by the spending levels that are already enshrined in a bipartisan budget deal (P.L.115-123). Representatives Seth Moulton (D-MA-6) and Gregg Harper (R-MS-3) have cosponsored H.R. 6611, a bill that would amend the Public Health Services Act to recognize individuals with developmental disabilities (DD) as a medically underserved population (MUP). This would significantly expand and improve services at health centers for people with developmental disabilities, something that disability advocates have sought for many years. Share the Dear Colleague letter with your Representative and encourage them to consider co-sponsoring the bill. This is an opportunity to share your experience and expertise related to the challenges that exist in accessing appropriate healthcare. Supreme Court nominee Brett Kavanaugh's confirmation hearings will begin during the first week of September. Senate Judiciary Committee Chairman Charles Grassley (R-IA) plans to hold the hearings on September 4, 5 and 6, followed by a confirmation vote by the entire Senate. Kavanaugh would fill the vacancy created by the retirement of Anthony Kennedy. Every Senator will have a vote, so contacting both your Senators to share your concerns and speaking specifically about the civil rights of people with disabilities is critical. Phone calls and in-person meetings (including in state offices) are the most impactful. 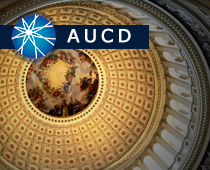 AUCD has an easy way to send an email to both of your Senators. You can find it here. If you live in their states, you are encouraged to activate your networks. If you are not in their states, consider reaching out to friends and urge them to activate their voices. This week, Liz talks about what "Nothing About Us Without Us" means, the importance of inclusion, and how people with disabilities can make sure their voices are heard when policy decisions about them are being made. Visit https://bit.ly/2OFTwEd to find information about your local UCEDD.